I feel it’s quite appropriate to post this interview on a Tuesday. This day now has a more sinister nickname, “Terror Tuesday”. Every few weeks, President Obama, John Brennan (new head of the C.I.A.) and other members of his national security team decide who lives and who dies via drone strike. A recent Gallup poll showed that a majority of American’s supported drone strikes in other countries against suspected terrorists, but most do not support strikes against U.S. citizens both at home and abroad. In addition to the secret drone program to kill people around the world, the U.S. is implementing surveillance drones on its soil for the first time in 2013. This invasive approach threatens the privacy and safety of American citizens, giving them no protection from these robot spies. There is one individual doing his part to give power and privacy back to the people, and his name is Adam Harvey. 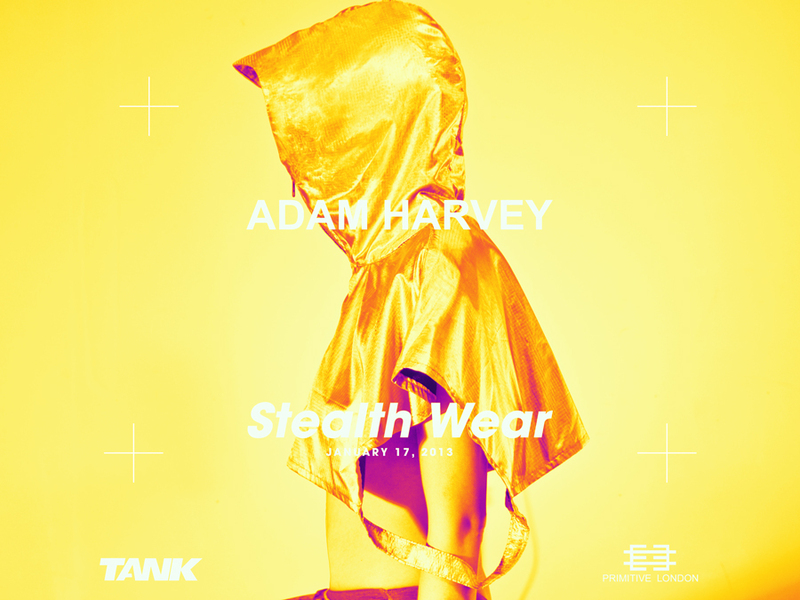 He’s created an intriguing counter-surveillance clothing line called “Stealth Wear”. His newest project has gotten significant press from news outlets such as Wired and RT and even the artist M.I.A., who tweeted about his camouflage gear. Be advised, these items are no longer for sale on the Primitive London site. But have no fear, Adam will soon be selling them at his online “Privacy Gift Shop”. Harvey agreed to do an interview for Disco Droppings, and we talked at great length about his work and the real life issues swirling around Stealth Wear..
DD I first heard about you in an RT article covering the debut of your clothing line, Stealth Wear. Shortly after viewing this, Abby Martin, the fierce host of RT’s Breaking The Set, named you hero of the day for your counter surveillance line. Do you feel the press and promotion are encouraging more dialogue about drone use? AH It is definitely encouraging conversation and this is really important. It took almost a decade to start having critical conversations about the impacts of the 2001 Patriot Act. And now, we’re having critical discussions about drone usage, including the banning of spy drones in Florida, even before they’re introduced. Any project that generates positive, critical discussion now is worth doing. DD The Federal Aviation Administration has said that by 2020, the number of domestic drones could be as large as 30,000. How much are Americans aware of this massive domestic drone proliferation, and the scope of domestic surveillance in America since 9/11 and The Patriot Act? AH Releasing this number also generated a lot of discussion. If evenly divided, that’s 600 drones per state. And fleets of at least several dozen in large cities, like where I live, in New York. I think Americans are smartening up to the impacts surveillance can have on privacy. But this is always subject to change. Safety is always more important than privacy. And so we’re always willing to give up more privacy in exchange for better security. That’s not necessarily a true equation though. Giving up privacy can make you weaker and more vulnerable too. It’s important to think surveillance through before implementing more of it, especially after the recent terror incident in Boston. Most all terror attacks in the US have been due to a lack of intelligence, not a lack of cameras or drones. It’s important to distinguish between the quest for safety and the right to privacy. Fleets of drones flying overhead doesn’t necessarily add safety to our lives, but it is very likely to erode privacy. DD Do you feel it’s important to connect domestic drone surveillance to the overseas drone surveillance and strikes carried out by the U.S. in countries such as Pakistan, Somalia and Yemen? I was reading a report titled, Living Under Drones: Death, Injury and Trauma to Civilians from US Drone Practices in Pakistan. They point out a large number of unacknowledged civilian casualties, psychological trauma to many in communities where drone strikes occur as well as only a 2% success rate for drones attempting to kill “high-level” targets. They don’t have as good a track record as some people think, and I see a slippery slope, where domestic drone surveillance could eventually morph to include domestic strikes against American citizens. AH Yes, that’s a very important point to call out. That once unleashed, it may become impossible to know and prevent armed drones from flying above us. At the very least, it will make a good case for 2nd amendment support. DD The private viewing of your line was on January 17th, 2013, with this “Privacy Mode” exhibition happening from January 18th to January 31st. After you were able to get reactions from the public, how long was it before Stealth Wear was available for purchase? AH The items went up for sale immediately on Primitive UK’s website. Their were several sales including one burqa. Overall the sales were decent. I still have some items available. During the next several months I will be unveiling a Privacy Gift Shop on my website where items from this show, as well as a few new pieces, can be purchased. DD One of the pieces featured in this exhibition is an “Anti-Drone Hoodie” and scarf. These are supposed to confuse thermal imaging, which is used by UAV’s (unmanned aerial vehicles) or drones. When thermal imaging cameras are used, warm objects stand out, such as humans and other warm-blooded animals. If for example, someone is wearing these pieces, and a drone is attempting to surveil them, would only body parts such as their legs be picked up, making the drone unsure of the object it is looking at? AH Yes, that’s basically the idea. Completely masking heat signatures is very difficult. Heat is emitted from your body and this appears as light to a thermal camera. The Stealth Wear garments are made with metalized fibers which reflect heat. This means the outside of the garment reflects the temperature of surrounding objects, and the inner layer reflects your heat. Of course that heat does not disappear. What you end up with is heat signatures that do not match that of a human. 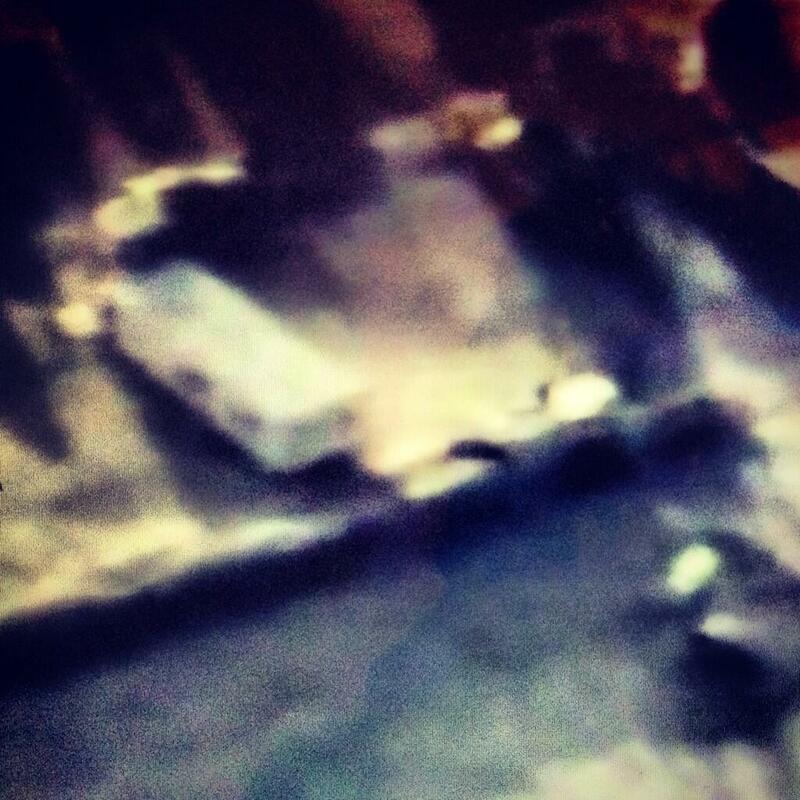 This is most effective for automated systems, using artificial intelligence to detect humans. And, to me, the automated unmanned uses of surveillance technology pose the greatest threat to privacy. DD Your exhibit was presented by Primitive London at Tank Magazine HQ, also in London, England. I read an interview with Primitive heads Lui Nemeth and Andrew Grune, for Still In Berlin in September 2011. They were asked about some of the pieces they carry being pretty extreme. They responded, “Not all the pieces we stock would be considered wearable, but we care more about exhibiting our designers work.”. What attracted you to Primitive London? And, would you describe your “Stealth Wear” as being wearable, and also forward thinking, in it’s style execution and purpose of use? AH I was invited to exhibit with Primitive through Nick Bates. He was interested in CV Dazzle and we met very briefly last summer at a coffee shop in London to discuss the potential for a show with Primitive. Originally, I had planned to exhibit new designs for CV Dazzle. When I showed Andrew and Lui a prototype for my new idea about anti-drone wear, they were very supportive. At that point, I had only made a hoodie. 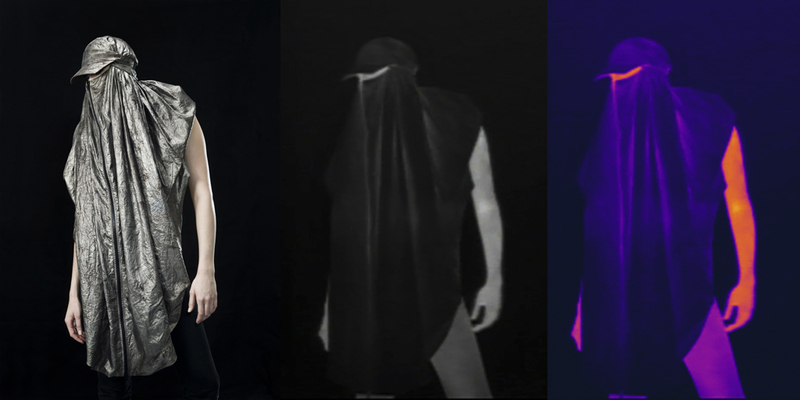 The next two pieces, the hijab and the burqa were much more directed and provocative pieces. DD Stealth Wear is in collaboration with fashion designer, Johanna Bloomfield. What do you think are Bloomfield’s strongest qualities as a designer, and how is her aesthetic represented in your new line? AH Johanna came into this project with a background in men’s fashion and sports apparel. The hoodie is all her design, made to shield the top portion of the wearer’s body and demonstrate the technology. The burqa was our collaboration that went through several revisions. I struggled with the idea of making any burqa at all, which I felt wold only reinforce an oppressive garment. Together, Johanna and I reworked the design into something more sporty. The burqa combines street-wear comfort with Middle Eastern heritage. DD Have you experienced any opposition from governments that do not understand or disagree with your attitude towards drones and surveillance? AH I have not experienced opposition from government entities, yet. Though, I am aware that my project did not go unnoticed. Somewhere between art and national security there is a line that cannot be crossed. I don’t know where it is. And sometimes I’m on both sides. DD Lastly, Rhizome did an artist profile on you back in June of last year. In their interview with you, writers are mentioned as key artistic influences. Who are some of these writers, and how has their philosophies, attitudes and/or themes influenced your work as an artist? AH Writers are interesting to me because they must create a story to write about or fabricate one. As a whole, I find this type of person intriguing. The most influential writer to me has been Susan Sontag. She made photography make sense to me. Another favorite critical voice of mine is that of Christopher Hitchens. He would stop at nothing to prove his point. That’s an admirable fault to have.